An engaging, accessible history of the focus group, Featherstone's survey shows how the primary purpose of the focus group has shifted from determining what we want, to selling us things we don't. The focus group, over the course of the last century, became an increasingly vital part of the way companies and politicians sold their products and policies with few areas of life, from salad dressing to health care legislation to our favorite TV shows, left untouched by moderators questioning controlled groups about what they liked and didn't. Divining Desire is the first-ever popular survey of this topic. 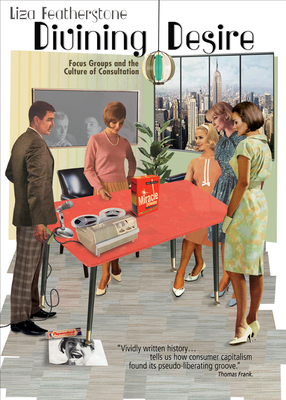 In a lively, sweeping survey, Liza Featherstone traces the surprising roots of the focus group in early-twentieth century European socialism, its subsequent use by the "Mad Men" of Madison Avenue, and its widespread employment today. She also explores such famous "failures" of the method as the doomed launch of the Ford Edsel, and the even more ill-fated attempt to introduce a new flavor of Coca Cola (which prompted street protests from devotees of the old formula). As elites became increasingly detached from the general public, they relied ever more on focus groups, whether to win votes or to sell products. And, in a society where many feel increasingly powerless, the focus group has at least offered the illusion that ordinary people can be heard and that their opinions count. Yet, the more they are listened to, the less power they have. That paradox is particularly stark today, when everyone can post an opinion on social media--our 24 hour "focus group"--yet only plutocrats can shape policy. In telling this story, Featherstone raises profound and fascinating questions about democracy and consumer society. LIZA FEATHERSTONE is a journalist based in New York City and a contributing editor to The Nation, where she also writes the advice column "Asking for a Friend." Her work has appeared in the New York Times, Ms., and Rolling Stone among many other outlets. She is the co-author of Students Against Sweatshops: The Making of a Movement (Verso, 2002) and author of Selling Women Short: The Landmark Battle for Worker's Rights at Wal-Mart (Basic, 2004). She is the editor of False Choices: The Faux Feminism of Hillary Clinton.